Space Safety Magazine continues the series of articles dedicated to space medicine and astronauts. In the series, we are presenting and exploring topics involving medical emergency management in space, astronaut training, and issues arising from long-duration missions in space. As the first chapter, we presented a profile interview with the physician and retired NASA astronaut Story Musgrave. In the second chapter, we looked at NASA’s medical kits through the years. The story continues here with a peek at possible future medical devices for solar system exploration. Virtual Incision Corp. co-founder and CTO Shane Farritor with the prototype of the mechanical surgeon (Credits: University of Nebraska-Lincoln). Manned solar system exploration will need more than powerful rockets and spaceships capable of sustaining human life for a long period. The on-going evolution of medical technology and accurate risk analyses continually raises the bar for the medical devices needed for a long-duration mission. In order for humans to travel and live outside “the cradle,” it is necessary to develop technology able to provide early diagnosis and effective treatment of health conditions. Current space medical technologies are still far from having the same effectiveness of ground medical equipment. Zero-gravity, power requirements, and size are the most important limits preventing the direct transfer of medical technology from ground applications to orbit. However, these same restrictions create incentives to find innovative solutions. Surgery so far has not been a real issue for astronauts aboard the International Space Station, mainly because they are carefully screened for health issues before missions. Even if an emergency were to arise, the crew can always return to Earth on an escape capsule and be in a hospital in a few hours. However, surgery will definitely become an issue on long-duration missions far from Earth; not only will the astronauts be too far for a quick reentry, but because of the lack of gravity, a surgical operation could cause blood to float free and contaminate the cabin, making it very difficult to carry out the operation as well as other activities. Prototypes of the robot-surgeon. These devices may be used to operate on astronauts during long-duration mission far from Earth (Credits: Virtual Incision Corp.). Virtual Incision (VI), a startup founded in 2006 and based in Lincoln, Nebraska, has developed in conjunction with NASA a fist-sized robot that may be able to perform some surgeries on astronauts during deep space missions. VI’s robot is only 0.4 kg and potentially, it could be used to operate inside an astronaut. Prototypes have been used to conduct several dozen procedures in pigs and the first zero-gravity test on a parabolic flight is expected in the coming months. The robot has two arms equipped with various tools making it able to grab things, suture tissue, and cauterize wounds. A camera on top of the robot provides feeds to a control station where a human surgeon controls the procedure using joysticks. The mechanical surgeon may physically enter the astronaut through a small abdominal incision and work from the interior of the patient once the abdominal cavity has been inflated with gas in order for the robot to have enough room to maneuver. Emergency appendectomy or repairing a perforated gastric ulcer are conditions that could be treated by such a device with a minimum loss of blood and other bodily fluids. However, in order to be truly effective during a long-duration mission far away from Earth, these tiny robots would have to function more autonomously. The delay in the communications between ground control and future space outposts would make it nearly impossible to perform such delicate operations from the ground. These devices would execute laparoscopic surgery, a technique in which operations in the abdomen are performed through small incisions. However, in space, even a straightforward operation like treating an infected abscess can become very problematic. While on Earth, the abscess should be simply opened and drained, in zero gravity such an operation, performed without proper measures, could likely contaminate the module environment because bodily fluids would not be contained. George Pantalos demonstrates the Aqueous Immersion Surgical System (Credits: University of Louisville). In order to make possible surgical operations in space, researchers at Carnegie Mellon and the University of Louisville in Kentucky, developed the Aqueous Immersion Surgical System (AISS). “The Aqueous Immersion Surgical System, or AISS, is a transparent box that creates a watertight seal when it is placed over a wound and pumped full of sterile saline solution,” George Pantalos, professor of surgery and bioengineering at the University of Louisville told New Scientist. The saline solution is held under pressure inside the AISS to prevent blood from seeping out of the wound. Airtight holes allow doctors to access the submerged wound using handheld instruments and scopes. The system can also be used to siphon and recycle blood by varying the pressure, saving blood from being wasted. “You won’t have a blood bank in space, so if there is bleeding you want to save as much blood as you can,” said James Burgess of Carnegie Mellon. AISS has been already tested on NASA parabolic flights where researchers performed surgery on a pig heart and on an artificial coronary system filled with synthetic blood. The project remains on track with the Technology Maturation Plan with the anticipation of having a fully functioning system by 2015. After surgery, it is very important, especially in space where the resources are limited, to recover as soon as possible. Even the space modules on the ISS are not immune to microorganisms and long-duration missions to other celestial bodies should take into account the expiration date of antibiotics and other drugs. Cold or non-thermal plasma could aid future space exploration missions due to its exceptional sterilizing capacity. Plasma, which is formed when gas is ionized, is one of the four fundamental states of matter along with solid, liquid, and gas and it is the most abundant form of matter in the universe, because most stars are in the plasma state. Plasmas typically exist at thousands of degrees, and hot plasmas are regularly used to sterilize surgical equipment. A cold plasma is one in which the thermal motion of the ions can be ignored and only the electric force is considered to act on the particles. Recently, researchers have been able to make cold plasmas at atmospheric pressure and in a range of temperature between 35°C to 40°C. Cold plasma was revealed to be particularly efficient in killing bacteria. Svetlana Ermolaeva and her research team at the Gamaleya Institute of Epidemiology and Microbiology in Moscow used a cold plasma torch in the lab to combat two common wound infections, Pseudomonas aeruginosa and Staphylococcus aureus. Although these bacteria are resistant to antibiotics, the cold plasma was able to kill 99% of bacteria in a Petri dish and 90% in rats’ wound with the added bonus of an increase in the rate of the wound closure. The results were published in the Journal of Medical Microbiology. “Cold plasmas are able to kill bacteria by damaging microbial DNA and surface structures without being harmful to human tissues. Importantly we have shown that plasma is able to kill bacteria growing in biofilms in wounds, although thicker biofilms show some resistance to treatment,” Ermolaeva said in a press release reported by ScienceDaily. 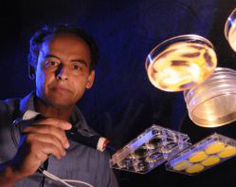 Laroussi with his plasma pencil (Credits: Old Dominion University). In 2005 Mounir Laroussi, professor of Electrical & Computer Engineering at Old Dominion University, invented a 12-centimer-long portable device called a plasma pencil that produces a short plume of non-thermal plasma. Researchers have still to discover the mechanism behind the many applications of cold plasma and the long-term effects; however, it appears to be a fundamental technology for sustainability and safety of space explorations. Although very far from the “tricorder,” the scanning device used by Leonard “Bones” McCoy in Star Trek, the compact Magnetic Resolution Imager (MRI) developed by researchers from the University of Saskatchewan, Canada, promises to be a game-changer to monitor the health of astronauts aboard the ISS and during possible future deep space missions. The full-size mock-up of the MRI imager introduced on September 13 at the annual AIAA conference (Credits: Gordon Sarty/ University of Saskatchewan). MRIs function by using radiofrequency coils that send signals to the organic tissue and receive the returning signal to build an image of the tissue’s inner structure. The machine is capable of producing detailed “sliced” images of human bodies or their parts. Whereas the conventional MRI weighs about 11 tons and costs about $2 million, the mass of the compact one is less than 1 ton and costs only $200,000, making it much more space- and cost-effective. Moreover, unlike the conventional MRI, the compact machine doesn’t rely on superconducting magnets that could create interference with the electronic equipment aboard a spacecraft. Instead, it uses a permanent Halbach magnet that is much lighter than the superconducting coil and does not create any detrimental stray magnetic field. In addition, the energy consumption required to power the magnets is much lower than in the case of coils. Needless to say, it would be useful during a deep space mission to be able to monitor bone and muscle loss processes and the impact of radiation. Below, a presentation of Virtual Incision Corp. at UNMC Startup Company Demonstration Day hosted on October 7, 2013, by UNeMed Corporation (Courtesy of UNeMed Corporation).